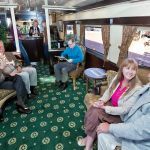 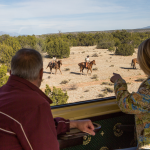 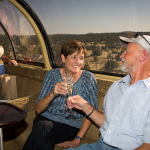 Embark on a new era of luxury rail travel with our fifth class of service, combining the breathtaking views of the Observation Dome with the opulence of our Parlor cars. 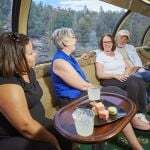 Don’t miss a minute of the surrounding scenery upstairs in the full-length dome with its extra-large windows. 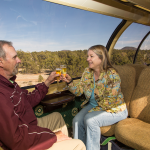 Downstairs, you can plan your day at the Grand Canyon with friends new and old, and enjoy a drink or some refreshments in the elegantly appointed lounge, which features a full bar, entertainment center, and plush furniture. 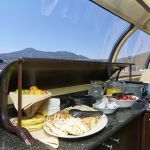 Exclusive service provides fresh fruit, pastries, coffee and juice during the morning, while snacks are available on the return trip along with a sparkling white wine toast, included in the ticket price. 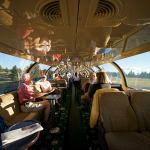 For the discerning traveler looking to experience the best of both Dome and Parlor classes, look no further. 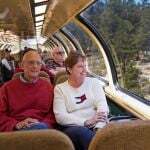 Children 15 and under not permitted.